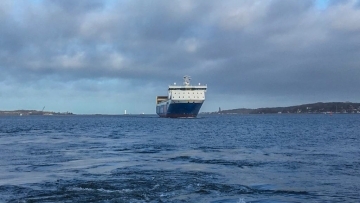 On Friday at 2.30 p.m., Color Line’s new cargo ship called the port of Kiel for the first time. Up to 36,000 units can be transported by Color Carrier annually. The cargo ship will moor in Kiel three times a week in the future. Our stevedoring and freight department are well prepared for this. An important factor are also the new reachstackers, lifting the units on and off the trains, which head for the Norwegenkai five times a week.